You've seen how decorative stamping can add beauty and drama to concrete floors, sidewalks, driveways and other horizontal surfaces. But did you know you can use similar stamping and texturing techniques to enhance vertical surfaces, such as the walls inside your home or business, a fireplace front or an exterior privacy wall? More decorative concrete contractors are literally climbing the walls to demonstrate new vertical applications for their artistry. They are defying gravity with the use of new lightweight cement-based wall overlay materials that can be applied directly over virtually any properly prepared wall surface, including concrete and masonry, wood, cement board, plaster, drywall and even insulating concrete forms (ICFs). These tenacious mixes are formulated to go on thickly without sagging, allowing them to be embellished with deep rock textures, wood-grain patterns, grout joints and many other carved or imprinted designs created with special stamps, texturing skins and sculpting tools. 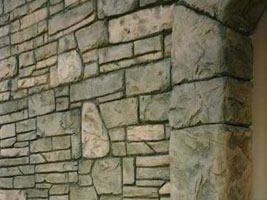 What's more, vertical overlays can be colored and stained to simulate the appearance of natural stone, brick or other wall materials. Hand-carved vertical overlays are one of the newest trends in decorative concrete, according to Nathan Giffin, owner of VerticalArtisans.com, who has turned basements into stone-walled coves and old closets into wine cellars. "The design possibilities are endless," he says. Wayne Sellon of Tajmawall is another contractor specializing in stamped and hand-carved vertical overlays. "My customers like the idea that they are getting something that's one of a kind," he says. "I can beat the price of stick-on rock and provide more variety in the texture and staining process." Stan Pace, owner of FossilCrete, a company that sells tools and materials for vertical resurfacing, says the process is perfect for mainstream use. "It's a monolithic system, it's strong, it can be colored and it's an easy application. There's lots of freedom, and it's like a natural product, only better." Vertical Overlay Design Possibilities Learn about where vertical overlays can be used and how they can be customized. Vertical Resurfacing Mixes Get information on the components of a vertical mix. Pattern & Texture Find out how stamping, texturing skins and hand carving techniques can be used on vertical surfaces.